Three candidates have been short-listed for the post of Bishop of Aberdeen (one of seven Dioceses of the Scottish Episcopal Church) which became vacant in July following the retirement of the Rt Rev Bruce Cameron who served the diocese of Aberdeen as Bishop for 14 years. The candidates have been selected by a committee of twelve people, chaired by the Primus, of clergy and church members representing the Diocese of Aberdeen and the wider Church. The next stage in the selection process is a meeting of each of the candidates with members of an Electoral Synod (representatives of clergy and lay church members from the Aberdeen diocese only). That meeting will take place on 9 December, with the election of the successful candidate taking place on 16 December. 1. The function of the committee chaired by The Primus (known as the Preparatory Committee) has been to receive suggestions of candidates from anyone within the Church who wished to propose a name for consideration. From those suggestions, the committee produced a short list of candidates for the Electoral Synod, following a series of interviews. The Rev. Canon Dr. Philip David Noble b.1946. Glasow University BSc 67; Edinburgh University BD70. Edinburgh Theological College 67. Deaconed 70, Priested 71. Curate Edin 70-72. Papua New Guinea 72-75 Rector Cambuslang Glasow 76-83. Rector Uddingston 76-83 Evangelist Prestwick from 83; Rector Prestwick from 85; Canon St Mary’s Cathedral from 99. The Very Rev. Canon Kevin Pearson, b 1954. Leeds University BA75. Edinburgh University BD79. Edinburgh Theological Collge 76. Deacon 79. Priest 80. Curate Horden, Durham 79-81. Chaplain Leeds University 81-87. Rector Edinburgh St Salvador 87-93. Chaplain Napier University 88-94. Diocesan Director of Ordinands 90-95. Provincial Director of Ordinands from 91. Associate Rector Edinburgh Old St Paul 93-94. Priest in charge Linlithgow 94-95. Rector Edinburgh St Michael & All Saints from 95. Canon St Mary’s Cathedral from 03. Dean of Edinburgh from 2004. How did I miss the fact that The Icicle Works were playing in Glasgow on the 19th October? I am so annoyed with myself. 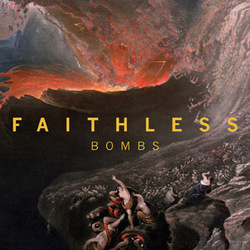 I have loved this band and the solo work of their leader, Ian McNabb, since the early 1980's. I must be getting old and losing my grip on what is happening in the music world. As I think about it, I was in Aberdeen that night, and spent a fine evening with friends. What could be more important in life than that? Tomorrow morning at 10am, the Immigration Appeal Tribunal hearing for one of our Indian families will take place. I'm attending along with another ministry colleague, Richard Gorrie. Please pray for wisdom for us as we stand alongside this family and for mercy from those who will make the judgement. People all over the world look to the UK as the mother country. Many on the Indian subcontinent, as well as Africa, are thankful, rather than resentful for what the days of Empire brought to their nations. The fact that much of our current prosperity as a nation has its roots in the wealth we exported from such nations (some might say stole), does not seem to upset many of my friends from such countries. I find it abhorrent that the UK government seems hellbent on clamping down on immigration. I can understand the fears over workers not paying taxes and so on, but wonder if more of an open door approach might win us some friends around the world, at a time when a little grace on our part might do us some good. Call me naive and simplistic, but in these days when barriers are coming down in terms of communication, it seems odd that national boundaries should be being strengthened so emphatically. Man: Can you loan me £10 until Wednesday? I promise I'll give you it back. Man: For me and my two friends. I had to admire his honesty. Like Her Majesty the Queen, I rarely have cash on me, so I too could be honest and say that I couldn't help him. I managed a short walk around the Ardess Hidden History Trail in between talks at Rowardennan Youth Hostel today. 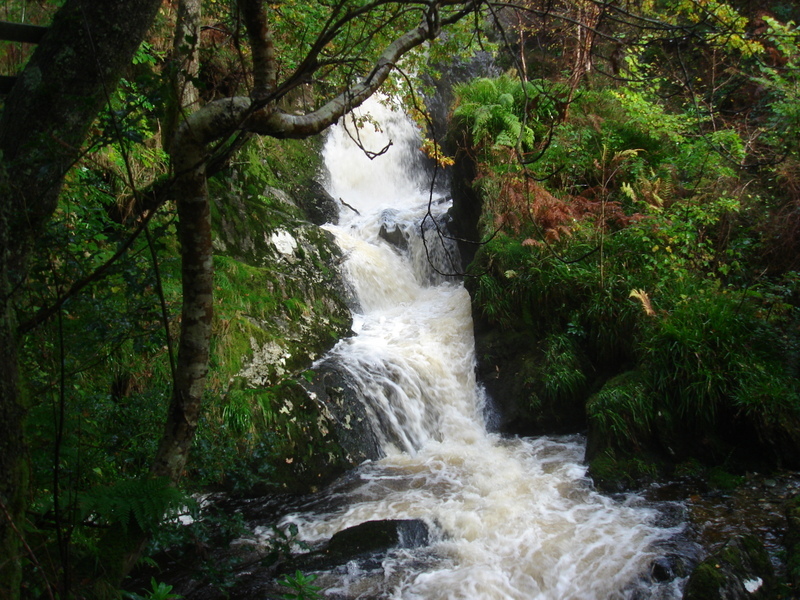 The heavy rain meant the burns were in spate, which was awesome. Even in the rain, Scotland is magnificent. The Glasgow Chinese Church were fun and receptive too! I was raised in a politically-left leaning family. My dad was a Trade Union shop steward. Without fail, we voted Labour. From the late eighties, Ms GadgetVicar and I were members of the Labour Party. On the night of the General Election in 1997, we hosted a party in our home to watch as events unfolded. We rejoiced that, 'Things Can Only Get Better'. Yet, come 2000, we had become disillusioned. It seemed to us that it was simply a case of similar policies to other parties, with only the faces at the top being different. So we left. Not to join another party, but to join the majority of people in the UK, who are not politically 'active'. Yet, we remain committed to values of justice, mercy and fairness. Last week I caught an episode of 'The Amazing Mrs Pritchard', the story of an ordinary woman who sets up her own political party and ends up being the Prime Minister. There is something very attractive about a mother and wife running of the country with common sense. Now we have the founding of the Scottish Christian People's Alliance. Their statement of principles reveal a mixture of conservative Christian morality and a radical support for peace and justice. This could well be a mix that will appeal to Scottish people, formed politically as they are by both socialist and conservative values. While Scotland is now overwhelmingly New Labour, the Unionist Party used to be strong, winning the majority of Scottish seats in the 1959 election. The downhill slide began in 1965 with its merger with the English Conservative party and they lost further support with the capitalist economics of the Thatcher years. Firstly, the quality of their candidates. If they can get ordinary, but intelligent and articulate people with real integrity to stand, this will help garner support. Secondly, the clarity of their communication. If they can get airtime and press space, which is then used creatively and constructively to engage with the hopes and aspirations of people, their ideas might gain traction. Thirdly, develop policies which offer the possibility of real transformation for communities and of peoples' lives. More of the same won't do. Lack of integrity will frustrate. Ardent religious polemic will not be winsome, no matter how 'right' it may be. Q. How did I manage to arrange to speak at Rowardennan Youth Hostel (for the Glasgow Chinese Church) this Saturday on Micah 6:8, St John's Evangelical Church, Linlithgow on Sunday morning on 2 Samuel 22, and St Silas' on Sunday evening on 1 Corinthians 2:6-16? A. Either my diary has a life of its own or (much more likely) I have not managed it well. 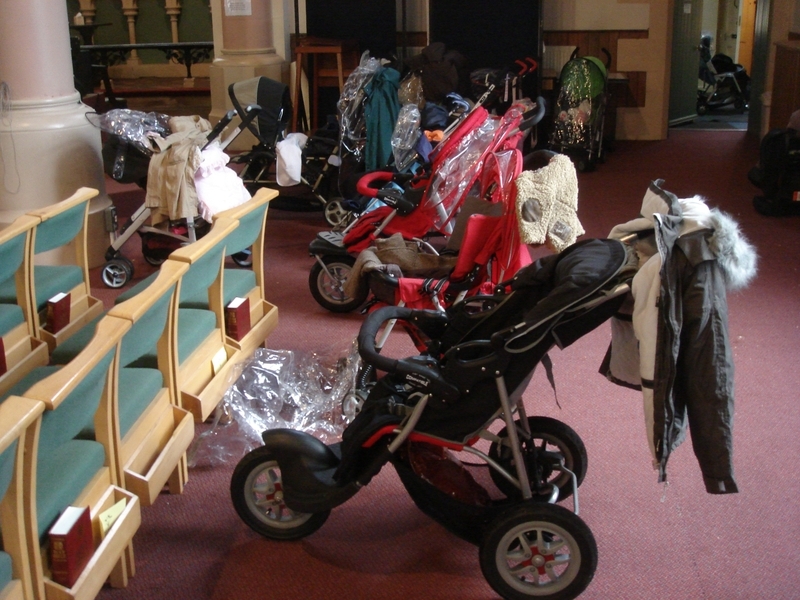 The 'Buggy Park' at St Silas'. I was much impressed when I popped in to 'Tots & Co', at church yesterday. It's a simple little ministry to the local community that allows parents, carers and children to meet up. We have been a bit rubbish at connecting locally, but individuals in the congregation have got the bit between their teeth and are putting some really good projects together to help us get better at it. Most importantly, I had a real sense of the Lord's presence with us. There was such joy in the place. I hope the confirmands enjoyed it all. +Derek Kamukwamba's sermon is available here. As he gave Christian Okeke a diocesan commission, ++Idris exhorted the congregation to consider whether God might be calling them to ordination, which gave me a wonderful opportunity to catch the eye of one or two people that God is calling to check it out. I highly recommend it - it is said that being in ordained ministry has one of the highest stress factors of any job, yet it also has the highest job satisfaction rating. Yesterday reflected both things for me! Note to self for next time - I must try and grow a stage crew who will stay up half the night emptying the baptismal tank. A pump is provided to drain the tank, but Christian Okeke and I got fed up waiting for that, and used buckets as well. If only I'd thought to get half-a-dozen others involved, I might have managed home before 11.30pm. I bade farewell to +Derek at Buchanan Street Bus Station very early this morning. I must get home for a snooze this afternoon.